Without mentioning either the US or China by name, IMF head Christine Lagarde warned about the dangers of the world being “sucked into a protectionist spiral” that would undermine global growth – the latest sign that the IMF’s upcoming global growth projection might be somewhat less enthusiastic than the nearly 4% rate for this year and next forecast by the IMF in January. While her organization remains optimistic, Lagarde said Wednesday during a speech in Hong Kong ahead of the annual spring meeting of the IMF next week in Washington that the global economy is benefiting from surging investment, recovering trade and “favorable” financial conditions (low or negative interest rates) all of which are encouraging companies and households to spend more money. The only problem is that as we have shown in recent weeks, this “coordinated recovery” is now over. Worse, growing protectionism could quickly reverse out all of this she said. “Yes, the current global picture is bright. But we can see darker clouds looming,” she said. Parroting an argument that has been made countless times since Trump unveiled his aluminum and steel tariffs, Lagarde said the rise in global trade reduced extreme poverty, reduced the cost of living and created millions of high-paying jobs. 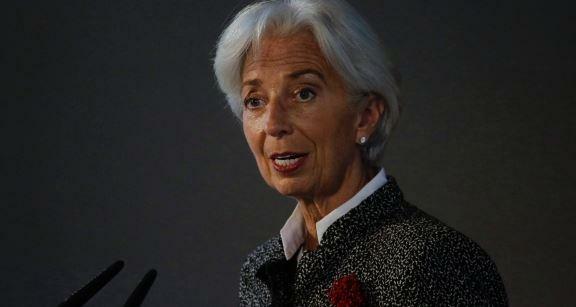 Import restrictions, Lagarde said, hurt everybody – especially the poorest consumers. But instead of the biggest risk being to the overall growth picture, Lagarde said trade barriers risk “undermining confidence”, which would in turn hurt investment.